My daughter, Sierra, has reached a milestone in her life. This weekend she said good-bye to elementary ways and will enter the halls of high school this fall. I often tease her that school after the 8th grade is mandated by law and large fuss over 8th grade graduation is not real necessary but I am really proud of the INDIVIDUAL she has become. My daughter’s maturity level reached years before graduating the 8th grade. I often contribute her good work ethic with living on farm. However in today’s world a child of a rural residence does not guarantee he or she will be raised with the same farm family values I was blessed with. Our parenting philosophy is old school. Raising her in an environment that instills hard work, allows for disappointment, learning by doing, and old fashioned discipline. Looking from the outside in, many may think we force our children into the world of agriculture but I disagree. We involve our children in activities on the cattle and grain farm. We let them get their hands dirty and explore their passions. Yes, the chore list around our house is different than our neighbors’ children but different does not make it wrong. We hope our children will leave our house with an independent spirit and strong pride of their agriculture roots. So on 8th grade graduation night, my daughter a young lady that the school has classified as “shy” stepped up to the microphone and confidently delivered her speech. Quiet, outgoing, crazy, adventurous, competitive… All of these words describe our class from the inside out. It seems like yesterday we were starting kindergarten; that was over nine years ago. Along the way we argued, laughed, and we watched kids come into our class and we watched some go. For the past decade or so we have shaped into the young ladies and gentlemen that you see sitting in front of you today. As we get older we separate into different groups, but we still walk the hallways together just like that first day. “I Show and I am the definition of dedication. I have felt the despair of “the gate” and I know that I don’t want that feeling again, and I have experienced the gratification of the handshake and I know that I want that feeling again, again, and again! I have been to the first pen and I am going back for more! There is skill in my hands, and magic and electricity in my step. While my classmates are watching TV, I am feeding, weighing, exercising, planning and practicing. If Mom’s got the video camera and Dad’s got a worried look it must be SHOWTIME I know that if it’s meant to be, it’s up to me. I know the REAL value of groovy tops, jacked fronts, and crisp loin edges. I know the best place to watch Grand Drive from is in the Ring! I will avoid corners and “low spots” at all costs. I can talk the talk and walk the walk and I’m not stopping until I grab the banner! After God, my family, and my country, my stock comes next. As most of you know this quote describes me 100 percent. To this day I’d rather wear a button down shirt, blue jeans, a belt, and cowboy boots with a harness on my back, my show stick in my left hand and my show heifer in my right instead of wearing this dress and heels. If you were to ask any person in my class who I am they’d tell you I am shy and that I have a passion they just don’t quite understand. Now, if you asked my family and friends they’d tell you my life is something many don’t get the chance to experience. Because of the way I grew up, I was given the opportunity to take this dream and make it a reality.Since the day I could walk and carry a feed bucket, at the same time, my life has been revolved around the world of agriculture. I could not imagine where I’d be if I’d never been raised in an agriculture lifestyle. Mom and dad, I’d like to thank you so much for allowing me to say that the life I grew up knowing is the life that I will forever live. 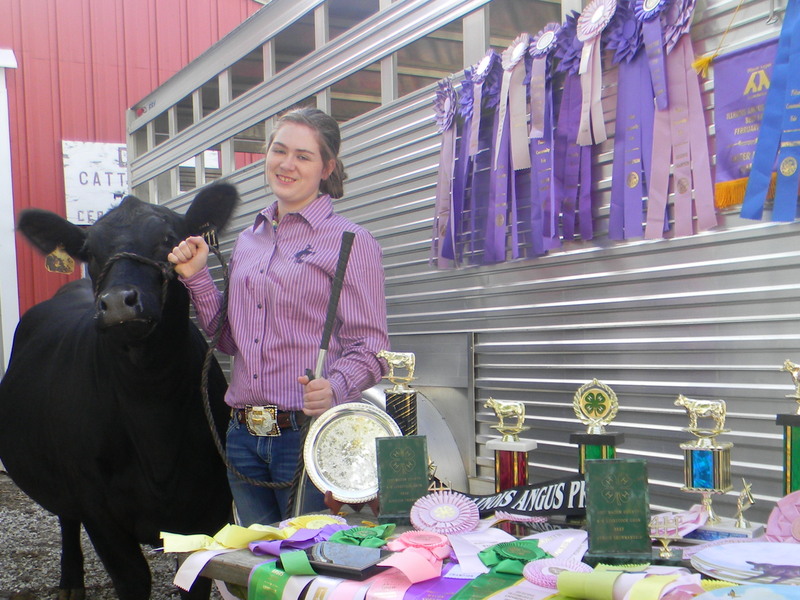 But let’s face it if it wasn’t for you I could not say that my biggest passion is raising and showing Angus cattle. Also, I’d like to thank my family and friends for teaching me one important lesson in the past 14 years, chase your dreams. I encourage every single one of you to find your passion and take it with you wherever you go. And I hope you allow it to lead you through the life you choose to live. So, to the classes behind me I encourage you to open your eyes to start thinking about who you are going to be. As for my class, it might just be me, but it doesn’t seem right. It feels like only a couple weeks ago that we couldn’t wait to grow up. We couldn’t wait to finish high school, to go to college, and to take the path that we have always wanted to take. Even though we are stepping closer and closer to our adulthood, I pray that you never lose hope. That you always follow your dreams and never give up on something you can’t go a day without thinking about. I wish that you take the path less traveled by because chances are that it is meant for you. And most importantly I hope you all have thought about who you’re going to be because, kids, we’re going to high school!